The concept of internet of everything involves an intelligent connection of people, processes, data, and things. In this sense, shared spaces aimed to connect different users that collaborate following a common purpose are of relevance to the field. Many computer-based collaborative environments have been proposed in recent years. However, the design of mixed-platform collaborative spaces, in which different paradigms—such as augmented reality (AR) and virtual reality (VR)—are blended, is still uncommon. This chapter aims to analyze the benefits and features of these systems, reviewing existing related works and proposing a series of features for the design of effective mixed-platform collaborative shared spaces. In particular, the authors propose five setups with different levels of immersion/interaction, which are aligned to the current state of the art. These systems will be analyzed with respect to navigation, user representation, interaction, and annotation, among others. Finally, some applications are proposed within the given framework. Virtual Reality (VR) and Mixed Reality (MR) technologies are increasingly used in a variety of applications, such as education (Dunleavy & Dede, 2014), entertainment (Olanda, Pérez, Morillo, Fernández, & Casas, 2006), edutainment (Vera, Gimeno, Casas, García-Pereira, & Portalés, 2017), medicine (Dickey et al., 2016), cultural heritage (Tscheu & Buhalis, 2016), manufacturing (Caudell & Mizell, 1992), engineering (Lau, Chan, & Wong, 2007), vehicle simulation (Casas, Rueda, Riera, & Fernández, 2012), retail (Bonetti, Warnaby, & Quinn, 2018), construction (Gimeno, Morillo, Casas, & Fernández, 2011), artistic expression (Portalés & Perales, 2009), home automation and assisted living (Ullah, Islam, Aktar, & Hossain, 2012), awareness (Casas, Portalés, García-Pereira, & Fernández, 2017), and many others. Therefore, VR and MR can be considered transversal technologies, covering a wide range of applications and areas of knowledge. These technologies include both hardware and software, involving a variety of sensors and displays, among others. Because of their nature and features, these technologies provide different benefits, which are sometimes complementary. For instance, VR allows the generation of safe environments in which different situations, potentially dangerous in real life, can be simulated; it can be used to perform virtual time travels and provide access to remote distant locations; etc. On the other hand, the MR technology, which includes both the Augmented Reality (AR) and Augmented Virtuality (AV) technologies, provides the presence of spatial cues for remote collaboration; allows that different virtual elements generated by a computer be spatially distributed; allows a seamless interaction between virtual and real objects, etc. However, the simultaneous use of these technologies within the context of the Internet of Everything (IoE) has been explored only by a few researchers. While the Internet of Things (IoT) refers to a network of a variety of physical devices, embedded with electronics, software, sensors, actuators, and connectivity which enables these things to connect and exchange data, the concept of IoE goes further, in a sense that it involves an intelligent connection of people, processes, data and things. In this regard, the concept of IoE in the context of the VR and MR technologies, implies providing greater levels of connectivity. It is possible to think of these paradigms (MR and VR) as things within the IoE, so that collaborative shared spaces, in which different users use different immersive technologies but with the aim to collaborate with each other, can be proposed in order for users to be able to cooperate to achieve a common purpose. Therefore, in shared spaces the MR and VR technologies expand their capabilities to the level that not only machine-to-machine (M2M) connections are possible, but also machine-to-people (M2P) and technology-assisted people-to-people (P2P) interactions. The unstoppable globalization of our society is also a force that drives this collaboration necessity. The need to work with people living in different parts of the world, something increasingly common in modern companies, which seek talent whenever this might be, makes remote collaboration an essential part of communication systems. Remote desktop applications, videoconferences and virtual blackboards are some of the mechanisms used to provide remote or local collaboration enhanced or provided by computer technology. This field is known as Computer Supported Cooperative Work (CSCW) and includes all sorts of computer-supported spaces where users can share ideas, procedures or knowledge. However, with the use of immersive technologies, such as VR or MR, this collaboration can potentially be as real as sharing a real space. The concept of shared space can be applied in several ways. The most common one is by using the Collaborative Virtual Environment (CVE) paradigm (Snowdon, Churchill, & Munro, 2001), sometimes referred as Distributed Virtual Environment (DVE) paradigm (Casas, Morillo, Gimeno, & Fernández, 2009), where several users share a common virtual space by means of the VR paradigm. These CVE/DVE systems have been largely explored and they will not be revised in this chapter. Virtual Reality: The technology by which a user, stimulated with computer-generated perceptual cues, experiences an alternative reality that is different from the one he/she actually lives in. Augmented Reality: The technology that simultaneously combines real and virtual objects that are interactive in real-time and are registered in a three-dimensional space. Shared Space: In the context of mixed reality technologies, a common space where users (remotely or not) can collaborate. Mixed Reality: The result of blending the physical world with a synthetic one, including the paradigms of augmented reality and augmented virtuality. Internet of Everything (IoE): The intelligent connection of people, processes, data, and things. 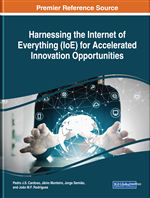 The IoE builds on the foundation of the IoT by adding network intelligence that allows convergence, orchestration and visibility across previously disparate systems. Interaction: A kind of action that occurs as two or more objects have an effect upon one another. Internet of Things (IoT): The interconnection via Internet of computing devices embedded in everyday objects, enabling them to send and receive data.